In August 2008, our two ramshackle boats, Free Gaza and Liberty, were hiding out somewhere in the Mediterranean, battling mechanical problems and bad weather as they slowly and furtively made their way to Cyprus. Thirty of us impatiently waited for the boats (and the 14 passengers and crew already on the boats) to come and get us. Finally, on August 21, 2008, they arrived. 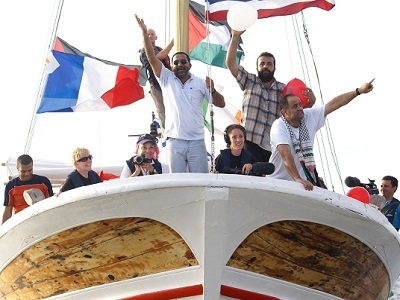 The next morning, the sun was shining when Free Gaza and Liberty finally pulled out to sea, and 44 passengers, journalists and crew had this overwhelming feeling of joy. We were finally sailing to Gaza. Crowds lined the dock and cheered us on as Free Gaza cast off her lines and headed out of the port, only to find that Liberty had engine trouble again. We waited for two hours as the engineer climbed down into the engine room and fixed the fan belt. Finally, the Cypriot Coast Guard escorted us to the 12-mile limit before sounding their horns and turning back. We were finally on our way, sailing 240 miles across the Mediterranean to the imprisoned people of Gaza. The Israeli government had been threatening us for weeks, demanding that we abort the mission, telling us they could not be responsible for our safety (as though we were somehow sailing to Israel and not to Gaza, a territory that Israel had been telling the world was no longer occupied.) We had found Israel’s Achilles’ heel. Israel had said it no longer occupied Gaza and had not occupied it since the government pulled out its illegal settlers in 2005. Therefore, by Israel’s own admission, Gaza was free to invite anyone who wanted to come and visit, to sail into its port and be welcomed. We were not asking for Israel’s permission. We didn’t need to. Gaza was free, and we were coming. No foreign vessel had docked in the port of Gaza for 41 years, as Israel tightened the screws of their blockade ever tighter, a 20-year blockade they said was all about security, but we knew was about collective punishment and plundering Gaza, stealing its natural gas. We came from 17 countries, from Palestine to Pakistan, from the U.S. to Europe, our ages from 81 to 22. We watched Larnaca twinkle in the distance as a cheer went up from both boats, “We are coming.” The journalists from Al Jazeera and Ramattan got on their satellite phones and called ahead to Gaza, “We Are Coming.” They were the last phone calls made, since Israel then blocked all of our communications the moment the sun went down, leaving us to steam ahead, not realizing that everyone watching our journey thought we had been sunk. Even though it was August, it was cold on the water, and we had not prepared ourselves for the damp. After a few hours being tossed about on rough seas, the water had drenched everything and everyone. We had two options; stay above on the deck and be cold and wet, or go down below to the cabins and inhale the diesel fuel. The cabins were dry, but the diesel fuel made even the experienced sailors gag. Most passengers chose to stay above. Thirty-three long and seasick hours later, we saw the Gaza City skyline gradually appear in front of us. As we got closer, fishing boats packed with people came out to greet us! The breakwater was packed wall-to wall with 40 thousand people cheering our arrival. Hundreds of boys swamout to our boats from the shore, as local fishing boats encircled us. It looked chaotic and dangerous, especially for the fearless young boys in the water. Several dignitaries came aboard our vessels via the fishing boats, and we were served tea and coffee while we attached a ladder to the sides of our boats to accept those who have swum out from shore. A Boy Scout band played for us from an adjacent boat. Pretty soon, both boats were jam-packed with people all over the deck and on the roof. We hadn’t even docked yet, and it was difficult to see how we would sail through all the crowds in the water as the boys grabbed the balloons we had been throwing overboard, all in the colors of the Palestinian flag, decorated with FREE PALESTINE. We had worried so much about being sunk at sea and were now facing the irony of being sunk by over-enthusiastic boys climbing onto everything they could. We had arrived. After two long years and hundreds of thousands of dollars and thousands of volunteers, we had arrived, a day none of us will ever forget. For one brief shining moment, Gaza had an open port. Now, in these terrible times for the people of Gaza, many of us wonder if our voyage was worth it. Whether the next four journeys when we landed safely resulted in any changes. Whether the brutal attack on the Freedom Flotilla in May 2010 when Israeli commandos murdered ten of our passengers made a difference; whether the world would finally listen to a people who simply wanted what all of us want…freedom. Today on our 6th anniversary, we remember the promises we made to the Palestinians of Gaza: 1. We would return, 2: We would take as many Palestinians out of Gaza as we could (we finally took 28, most of them students who are doing very well) and 3. We would let the world know what Israel is doing to an imprisoned population. An Israeli mortar had sliced off Sa’ir’s leg at the hip in 2006, and there was little hope he would ever walk again. He does, and he is thriving. On September 8, 2014, Musheir ElFarra, the Palestinian from Gaza who was on the Free Gaza, an engineer living in the UK who just wanted to go home to visit his mother’s grave will be on Break the Set, Russia Today, talking about our first trip to Gaza. His words when he arrived that momentous day should never be forgotten. As we remember the 6th anniversary of our arrival, the Freedom Flotilla Coalition is already planning another voyage, hopefully in 2014, the International Year of Solidarity with the Palestinian People. So to all Palestinians in the occupied territories: we are coming. We have not forgotten you. We will return. – Free Gaza Movement is a human rights group that sailed 5 times into port of Gaza. This article was contribtued to PalestineChronicle.com. Thank you for publishing this story of our first trip. It was a day we will never forget and we hope will be repeated. It changed the lives of all of us, the 44 passengers on the boats and the thousands of Palestinians who met us on the shores. An unforgettable day for sure. I still get chills thinking about that moment when we finally saw the shores of Gaza in the distance. Greta and I stood hugging each other and wondering if it could really be true… were we really going to stand on the shores of Gaza? As we got ever closer we tossed “Free Palestine” balloons, red, white, black and green, into the water as small boats surrounded us and young men from local fishing boats jumped in to collect them. Dear Vittorio was with us on FREE GAZA, and I’ll never forget seeing the joy with which he fell to his knees and kissed the sands of Gaza Beach. Thank God the flotillas are still sailing. The occupation needs to be challenged, now more than ever. The World will be watching! An amazing achievement bringing much needed attention to the illegal Israeli siege of Gaza. Wishing you further triumphs in 2014. Free Palestine!